A survey was recently carried out by Kaiser Family Foundation which included almost 2000 patients. The survey found out that 57% of young patients are satisfied with EMR technology, they said that the patient care has improved. On the other hand, only 6% of the patients believed that EHR technology has worsened patient care. Majority of the patients who said that they are satisfied with Electronic Medical Records (EMR) software aged 18-29. More than half of the patients said that EMR systems have also improved patient-provider communication. Since EMR adoption became mandatory in 2009, there has been a certain dip in public opinion regarding the benefits of EHR use. A similar kind of survey was carried out in 2009. That survey suggested that 67% of general believed that EMR use will improve patient care. After a decade, only 45% of the surveyed patients actually believed that EHR/PM technology has improved care. Another interesting find was that 47% of the patients said that patient care has remained the same since Electronic Health Records (EHR) software adoption. Regardless of the fact that there has been a dip in satisfaction over EMR technology in the last 10 years, just 6% of the patients believe that this technology has that worsened healthcare quality. 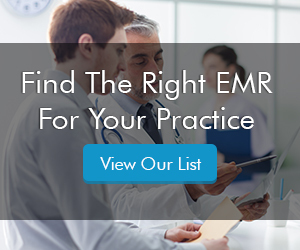 Electronic Medical Records (EMR) software and Practice Management (PM) software usage has become very common in hospitals and clinics since 2009. 90% of the patients have reported that their physicians engage in EMR data documentation during patient appointments. While few patients are concerned over problems with patient-provider communication, many worry EMR data entry errors may negatively affect care delivery. Nearly half of surveyed patients stated they are at least somewhat concerned about the potential for EHR software data entry errors. 21% stated they or a family member have noticed an error of some kind in their medical record. 45% of surveyed physicians stated their belief that EHR/PM technology negatively affects the patient-provider relationship, while 61% said EMR systems disrupt clinical workflows and lessen clinical productivity. Only 14% of survey respondents reported having a positive experience with EHR software vendors, and most respondents named EHR systems and federal regulations as the top causes of physician burnout.